Select a question below, or search the FAQs to find answers to some of our most commonly asked questions. Or contact us if you have a specific question. No, you can place an order without creating an online account. However, there are many benefits in creating an online account. If you want to cancel an order, please contact us. Unfortunately, once your order has been dispatched it’s too late to cancel the order. Find out about how to arrange returning an order. How do I find out if my order has been processed? Once you place your order, you will receive an email from us to confirm that we’ve received your order. Then when the order has been processed and your items are ready to be sent to you, you will receive another email from us. If you haven’t received either of these emails in your inbox, please check your junk mail folder. If you find an email from Interweave in the junk, move it to your inbox to ensure that any future emails from us arrive in your inbox. You can also add our email address (weborders@interweavetextiles.com) to your safe senders list (or trusted senders list) depending on your email software. 2) Businesses can place an order through the website and opt to pay by 30 day credit account (apply for a credit account here). How does Interweave protect my personal information? I have an online account, how do I use the Quick Order form? Please log into your online account and select Quick Order. The Quick Order form will display a list of the items you have most recently ordered. To re-order any of these items, simply select how many of each you need using the dropdown menus. To order items not already included in your list on the Quick Order page, use the search function to look for the items you need and add them to your Quick Order. I work for the NHS, can I buy Interweave products through the NHS Supply Chain? We use this icon on our website to show which products are available via the NHS Supply Chain. If you want to order an NHS Supply Chain product, simply click-through to see the product details on our website and then click the NHS Supply Chain link on that page. It will open up the same product on the NHS Supply Chain website. You will just need to login with your NHS Supply Chain account and proceed with your order as you would normally. For products not available via the NHS Supply Chain, please either contact us or place your order directly through the Interweave website. I’ve cancelled my order, when will I receive the refund? If you cancel an order before it’s been dispatched, we will confirm with you by email that we have been able to cancel the order in time. In that case, we will process the cancellation refund within 2 working days. Please allow up to 5 days for it to be available in your bank account. If the order has already been dispatched, please read about how to arrange returning the items to us. Once we receive the parcel and have checked that the items are still in perfect condition, we will confirm with you by email. Then the refund will be processed within 2 working days. However, please note that the delivery cost will only be refunded in exceptional circumstances. Please allow up to 5 days for the refund to be available in your bank account. You can pay for orders by credit card and debit cards, we accept Visa Debit, Visa Credit, Mastercard and American Express. You may also apply for a business 30 day credit account, simply complete the online application form and we will process your application within two working days for you. Then when you place an online order, we will invoice you and you’ll have 30 days to pay the invoice. If you opt to pay by credit card or debit card, the payment will be processed online straight away at the time of the order. If you order via a business 30 day credit account, you will be invoiced at the time of the order. You will be required to pay the invoice within 30 days of the order date. You can pay for the invoice by the following methods: BACS, online bank transfer, credit or debit card via PayPal or by cheque. Will I be charged VAT on my orders? Yes, by default, you will be charged VAT on all items. We have provided the facility within the website to view products either with or without VAT for your convenience, however you will be charged VAT when you pay for your order. For all stocked items – if you purchase 10 or more of an item you will pay 2.5% less per item. If you purchase 20 or more of a stocked item you’ll get a 5% discount on those items. If you buy 100 or more of a stocked item you’ll get a 10% discount on those items. Yes, the Interweave Healthcare website has up-to-date website security and is fully secured by using SSL (Secure Sockets Layer) to encrypt the data in both directions. Website security is vitally important. A website that has SSL security protects your data by encrypting the information you enter into the website. For example, if you are filling in a contact form, the SSL encrypts your name, address and email address. This prevents the data being leaked, because it is only transmitted between your computer and the server you are sending the contact form request to. What's the last order date for Christmas deliveries? The last date for pre-Christmas UK mainland orders is 2pm on Thursday 20 December 2018, which will be delivered on Friday 21 December. Any orders for delivery to UK mainland placed after this will be delivered from Thursday 3 January 2019 and onwards. If you require an order delivering to Scottish Highlands or other non-mainland addresses, please note that any orders placed by Monday 17 December will be delivered by Friday 21 December. Any orders placed on or after Tuesday 18 December will be delivered from Thursday 3 January 2019 and onwards. Can I order a sample of a product? Please order one of the item online. We offer next day delivery on orders placed before 2pm, when delivering to UK mainland. Your single product will be with you very quickly, so that you can evaluate the product and go back online to order more when you are happy that the sample meets your needs. Can I check availability of items online? All items on the website are in stock, unless there is an “out of stock” indicator displayed. If we have less items in stock than you need for your order this will also be displayed on the product page once you have entered the quantity you wish to order. If it appears the product is out of stock on the website, please contact us, we can advise you on the next delivery date. Each product listed on the website has sizes displayed under Additional information. In some cases, where the sizing can be quite complex such as scrub suits or slipper socks, you might find it helpful to look at the detailed sizing information on the individual product data sheets or in our product catalogue. All sizes are shown in metric measurements (cm, m, kg etc). If you need to convert to imperial measurements, try this converter. Can I buy contract textiles? Can you wash a mattress protector? Mattress protectors can be washed in either a normal domestic washing machine or a commercial laundry washing machine at a regular 40C to 70C temperature. However, as there is a waterproof layer within the mattress protector which typically contains some plastic, it’s important to tumble dry at a low temperature or wait for it dry naturally to prevent the plastic melting. Bariatric is a term used in the medical community that means obesity. In the UK, the NHS classes patients as obese if they either have a Body Mass Index (BMI) of 40 or more; or if they weigh more than 25 stones (or 159kg). In a hospital, surgery is offered to treat obese patients. Interweave Healthcare supplies some products to help nurses and carers looking after obese patients in hospitals, care homes and at home. These include the 10XL patient gown, the transfer sheet and the Airpal patient transfer system. Slipper socks are socks are worn on the feet, with anti-slip gripping tread on the sole of the foot to prevent falling on slippery surfaces. UK hospitals provide these to patients who stay in the hospital overnight. Some have the grippy tread on both the sole and the top of the foot. 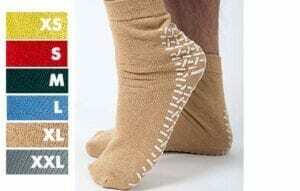 This is so that even if the socks twist around when walking, the patient is less likely to fall. What is a cellular blanket? 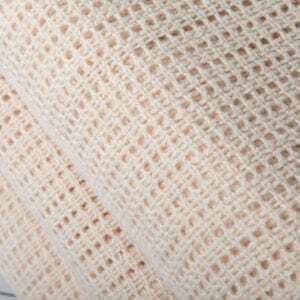 A cellular blanket is designed to have holes in the weave creating a lot of “cells” within the blanket fabric. The cells trap warm air to keep you warm in cooler times and let warm air out when necessary to keep your body at the optimum temperature. Therefore, they are ideal for all year round use. Many people layer up a few on top of a bed for maximum warmth. What's the difference between double tread and fall prevention? Double tread and fall prevention slipper socks are designed in the same way with tread on both the top and sole of the foot. The reason for having the latex-free non-slip tread on both sides of the sock foot is to prevent falls, even if the sock slips around the foot in bed, or whilst walking there will always be some tread sticking to the floor. However, the fall prevention socks are manufactured in bright colours for all sizes – to make it easy for nursing staff or care home staff to easily identify which patients or residents are most likely to fall. Double tread slipper socks are different in so much as they are colour coded by size, i.e. each size is a different colour for easy size recognition in a busy hospital ward or care home environment. What do you wear under a hospital gown? When you attend hospital for an appointment, you may be asked to wear a hospital patient gown for a procedure, for example for an x-ray or colonoscopy. The nursing staff will explain to you what to wear under the gown, as it varies depending on the type of procedure. In the majority of cases, you will be asked to just leave underwear on underneath. Interweave provides the Dignity hospital gown to many hospitals, as this provides the patient with more dignity. The Dignity gown covers the whole body and features simple straps to tie up; meaning that patients don’t need to ask for help fastening fiddly poppers. 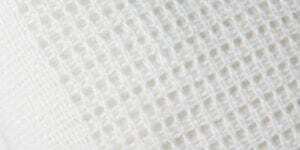 Cellular blankets are woven with cell-like holes in the pattern. They are commonly woven from cotton, polyester, acrylic or wool. The cells or holes in the blanket allow air to move into the fibres, which heat up with the warmth of the body and the warm air becomes trapped inside the layers. 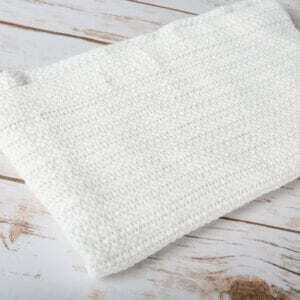 This causes the blanket to warm up more quickly than one with a non-cellular weave. In Winter months or when you are feeling a chill, it is recommended to wrap up in many cellular blankets for the most effective warm-up. 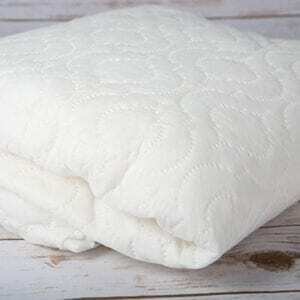 The lightweight, breathable cellular designed blankets are also useful in Summer months, especially the cellular cotton blankets, as they can keep a breeze out without overheating. Hospital maternity wards and private birth centres rely on these blankets all year round to keep babies warm in cribs and cots. Likewise, nursing homes use single bed size cellular blankets to keep residents warm without overheating. What are hospital gowns called? They have many names, depending on the purpose and style of the gown. 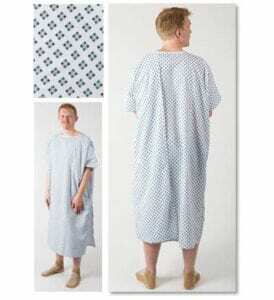 Generally known as “hospital gowns” collectively, they are also referred to by many as patient gowns or medical gowns. Not to be confused with surgical gowns, which is the protective clothing worn by surgeons and operating theatre staff. 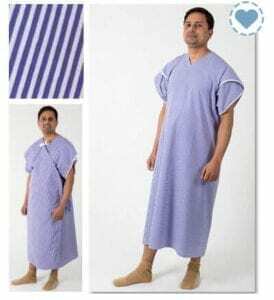 Interweave provides UK hospitals with many different types of gowns including the operation gown which is a traditional white back-tying polycotton gown. Other names used are: lapover gown, dignity gown, popper gown and pullover gown. Interweave also provides an innovative three-arm toga, which takes away all the effort of putting on a gown properly, as there are no ties, poppers or straps – the patient simply puts it on over both arms like a backwards coat and then wraps the third arm around the body and slides it onto the left arm. A “scrub” is a shortened version of “scrub suit”, which are sanitary garments worn by doctors, nurses, surgeons, and other workers involved in patient care. Scrubs are typically worn in hospitals, clinics, dental surgeries and vets. However, beauty salon staff also sometimes wear scrubs, so do some childcare staff. Any job where you are likely to get very messy and potentially covered in bacteria, is a job where you would benefit from wearing a scrub suit. Scrubs are washable at high temperatures, providing a way to thermally disinfect the clothing after a shift. Available in two parts, a top and trousers, they are worn by both men and women so styles tend to be designed to be unisex for convenience. The Interweave range includes performance scrub suits which are used by the NHS, nursing tunics as well as the branded WonderWink Origins range and Cherokee. Do I put on the mattress topper or protector first? That’s a good question! To which there’s no strictly correct or incorrect answer. However, we believe that a mattress topper acts as an extension to the mattress, and is used to increase the comfort of a bed. Ideally, therefore, the mattress protector should go on top of this, to keep the mattress protector clean and dry. Mattresses can be protected from water damage by having a mattress protector put on the bed underneath the sheets. The protection is enhanced further if you use one with elasticated edging to wrap around the corners of the mattress. Choose this one, a lightweight breathable polycotton with a waterproof layer inside to prevent water leaking through to the mattress. Elasticated edges wrap snugly around the corners keeping the sides protected from damp and moisture too. You’ll find this is a worthwhile investment if there are issues of incontinence to deal with. Are all mattress protectors waterproof? Not all mattress protectors are waterproof, no. Some mattress protectors are instead designed to add a layer of comfort to the bed and to keep the mattress clean. Most importantly, the ones that are waterproof will be labelled as waterproof or water resistant. You should be aware that water resistant means that some moisture may seep through, whereas water proof means that the moisture is prevented from moving down to the next layer, usually with the addition of a plastic layer in the middle of the protector. The Interweave waterproof mattress protectors are made of a lightweight breathable polycotton with a waterproof layer inside to prevent water leaking through to the mattress. These mattress protectors have elasticated edges which wrap snugly around the corners of the mattress keeping the top and sides clean and dry. Do waterproof mattress protectors work? Simply put, yes – waterproof mattress protectors do work. That is to say that they are designed to make your mattresses last longer and generally they do that. Our mattress protectors have elasticated edges which wrap snugly around the corners of the mattress keeping both the top and the sides protected from spills, damp and dirt. Some manufacturers may claim that their mattress protectors are waterproof but be careful to check for the volume of liquid that can be absorbed and check that the seams are double stitched for extra strength. The Interweave range of mattress protectors includes a waterproof bed pad, a waterproof mattress protector and a quilted mattress protector. Do mattress protectors make you sweat? Mattress protectors are designed to protect the mattress from things such as sweat, stains, and dirt, to lengthen the lifetime usage of a mattress. However, the waterproof barrier provided by the mattress protector can make some people feel hot or sweaty, especially if they are already prone to overheating whilst sleeping. If you are concerned that the mattress protector might increase sweating in the night, perhaps you could try a draw sheet placed under the bed sheet instead. Draw sheets don’t have a waterproof layer but instead absorb any dampness caused by sweating. You could also consider a bed pad which although it has a waterproof layer inside, has a comfortable fabric outer cover and can absorb an enormous amount of liquid and damp. Where to buy slipper socks? If you are looking for dependable non-slip socks with latex-free tread then Interweave offers a full range of sizes in different styles. We have a full range of single tread, double tread and fall prevention slipper socks available for purchase through our website, via the NHS Supply Chain (if you are buying products for the NHS), or from us directly over the phone or by email. What size sheets do you need for a hospital bed? Hospital bed linen is typically a standard or extra long size to fit hospital beds. Our hospital quality bed linen comes in a standard size of 178cm x 275cm, or extra long 175cm x 300cm. However, if you don’t know the exact mattress size, youcould use stretchy bed linen that fits any size of single bed. The Interfit range of hospital bedding is constructed from four-way stretch fabric that makes changing hospital bed linen very quick and easy, even for just one person. The Interfit knitted fitted bottom sheets and semi-fitted top sheets are so stretchy they will comfortably fit any single bed. Why do hospital gowns open in the back? Hospital gowns with an open back are designed to allow medical staff easy access to whichever part of the patient is required. The Lapover Gown – Used by hospitals across the UK, patients say this gown is comfortable and easy to put on. The gown is fastened with colour-coded ties at the back. The Dignity Gown – this gown offers a full-width wrapover later offering the patient more dignity than other gowns. It is reversible, and can fasten at the front or the back depending on what is appropriate for the procedure. 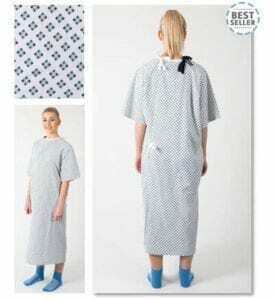 The Operation Gown – this is a unisex gown which fastens at the back. It is easily removable during a surgical procedure. The Popper Gown – this gown features popper fastenings down the back and also across the shoulders. This allows for removal of the gown even when a patient has IV lines into the arms. The Pullover Gown – with no ties or poppers, this gown simply pulls over the patient’s head. The Three Arm Toga Gown – this gown offers a full wrapover for more patient dignity than the traditional lapover gown. There are no fastenings – the third arm simply wraps around the body and goes over the first arm. The Mammography Gown – this gown is specially designed to pull over the head to cover the upper body. The Bariatric Gown – our bariatric gowns come in size 4XL and size 10XL. These are both lapover gowns, with fabric ties. Who invented the hospital gown? The original hospital gown was designed around 100 years ago for use on patients admitted the night before surgery, who were sedated prior to transfer to the anesthetic room whilst half asleep. It’s not known who actually originally invented the gown. Where can I buy hospital bed sheets? Interweave supplies a wide range of hospital bed sheets to healthcare organisations such as the NHS, private hospitals, care homes and contract laundries. The bed sheets are available in either single or double size. The single sheets are available in standard length or the longer length for hospital beds. Choose fitted sheets or flat bed sheets from a variety of fabrics, all kept in stock and available for immediate delivery: polycotton sheets, cotton rich sheets, flame resistant polyester sheets, non-woven disposable sheets and matching pillowcases. 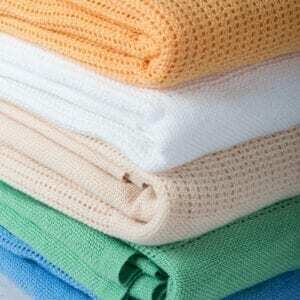 For children’s wards, we stock cot sheets in polycotton and cotton rich fabrics. You may also be interested in protective draw sheets and mattress protectors. What are hospital pillows made of? Some hospital pillows have wipe clean fabric, other hospital pillows are flame retardant and fully waterproof with ultrasonically welded seams to prevent leakage. Hospitals typically stock a range of different pillows for particular scenarios in wards and departments. The weighted blanket should be purchased for the individual who will be using it, as it needs to be approximately 10%-15% of their body weight to work effectively. This amount of weight provides the body with the effects of Deep Touch Pressure (DTP), which gently applies surface pressure all over the body and releases serotonin and dopamine, biological chemicals that promote relaxation. In the case of the Interweave weighted blanket, select the appropriate weight from the list below. For orders over £100 including VAT, delivery is free to UK mainland addresses. The delivery cost for your order to your address will be calculated in the checkout. Please contact us if you have any other questions about delivery costs. All orders over £100 including VAT are eligible for free next day delivery to addresses in mainland UK (excluding Scottish Highlands). If you live outside of mainland UK, please check our delivery charges information. As we hold large quantities of stock, we can fulfil your order straight away. Your order will be dispatched as soon as possible. If you place an order before 2pm on a working day (see our opening hours), your parcel will be dispatched the same day. If your order arrives to us after 2pm, it will be dispatched the next day. If your delivery is to a UK mainland address, you will receive an email with a link to the parcel tracker service provided by either Parcelforce, APC or DX. Track your delivery online by clicking the link. If your delivery address is not in mainland UK, please contact us with any delivery queries. If your delivery is late, please firstly check the delivery tracker online (you will have received an email from us with an online tracking link). If the tracker isn’t working, or if you have further questions please contact us to let us know that your delivery is late so that we may help you. Please contact us to let us know that your delivery is late so that we may help you. How does the UK mainland next day delivery service work? Deliveries to UK mainland addresses are despatched the same day (if the order is received by 2pm). Deliveries are despatched during working days, i.e. Monday to Friday, except on public holidays. For Monday to Thursday orders, the delivery will arrive the next day before 5pm. Friday orders will arrive during the day on the following Monday. I live in the UK but not mainland, how long will my delivery take? Northern Ireland: Your delivery will take 2 days to arrive. Scottish Highlands, Isle of Wight, Channel Islands, Isle of Man: Your delivery will take 3 days to arrive. Yes, we can deliver to non-UK addresses, however the website postage calculator won’t be able to provide you with the postage cost. Please select the items you wish to buy, add them to the shopping basket, then click on Share & Save Basket and send the basket link to us by using the contact us form. We will calculate the most effective delivery cost and let you know within one business day. To be eligible for a refund, the item/s must be either unused and in the same condition that you received it and be returned in the original packaging so that it is fit for resale; or be faulty at the time of delivery. Please read our returns policy for more information. My delivery has arrived but is incomplete, what can I do? Please refer to your delivery note to check that we haven’t despatched a part-order. If the delivery note shows the complete order please contact us as soon as possible, we’ll sort it out for you. I’ve received a faulty item, what do I do? Please contact us as soon as possible, we’ll sort it out for you. Please send the items in original package with the delivery note, to our warehouse: Victoria Works, Whitwell Green Lane, Elland, West Yorkshire, HX5 9BJ. Once your returned items are received and inspected, you will receive an email to notify you that we have received your returned item/s and that the packaging is intact. We will also notify you of the status of your refund application shortly after. Please read our returns policy for more information. Can I return something and receive an exchange? If you would like to exchange an item please email us with the details. Please read our returns policy for more information. You have 31 days to return the item to us. Please read our returns policy for more information. Please use the “Forgotten password” link on the login page, then you will receive an email with a link to set a new password yourself. This is the quickest and easiest way to change your password. Alternatively, you could contact us and our team will do their best to assist you. How can I get in touch with your Customer Services team? Please use the details on the Contact page, you can either send an email or phone us. Office opening hours are 8:30am to 5pm Monday to Friday. I’m having problems logging into my online account, what should I do? Please use the forgotten password link to have a new password emailed to you. If you have forgotten the email address you used to log in, please contact us for some help. I’d like to close my online account, how do I do this? We’re sorry to see you go but please contact us, we’ll be able to help close down your online account. How do I dispose of old pillows and duvets? Commercial waste collecting companies will accept old duvets and pillows in the landfill bin. However as they’re so large, they will take up a lot of space. Unfortunately, every year 14 million duvets, pillows and mattress toppers end up in UK landfills. So thinking of an alternative to this disposal method would be better for the environment. Some people recommend trying to donate them to a local pet refuge or sanctuary. For example the RSPCA, who may be interested in taking old pillows and duvets for animal bedding. Other people suggest asking colleagues, friends and family who own dogs or cats to see if they want them for pet bedding. Likewise, some homeless shelters may accept donations of old pillows and duvets, as well as any old blankets. Otherwise, perhaps you could find a way to recycle the duvet or pillow at home or in the workplace. 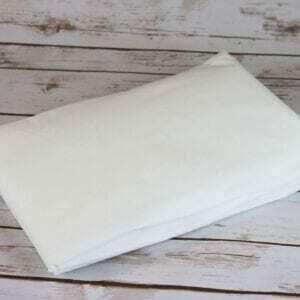 Such as cutting the duvet and pillows into smaller pieces and use to clean the floors, or wash vehicles. 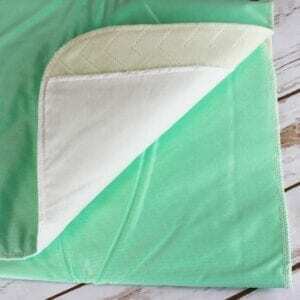 If you are handy with a sewing machine, the duvet or pillow filling could be upcycled. Take out the filling and use it to fill draught excluders or floor cushions. Other people have put cotton and feather duvets in compost bins and they have over time biodegraded down to mulch. But remember that you will need to remove all poppers, labels etc before putting it in the compost bin. It’s also worth contacting your local council, or check the recycling policies on their website to see if they have any services for this. Find your local council website here. How do I use a slide sheet? Slide sheets are used to move patients in a variety of different ways. Used in hospitals, clinics, care homes and in the home; they provide an easier way of moving or transferring somebody without the nurse or carer suffering an injury. Back injury is particularly common and can be avoided with the use of a slide sheet. For this reason, Interweave Healthcare is a member of the National Back Exchange. Some people prefer to use two flat slide sheets, one on top of the other, which are then placed underneath the patient. Or you could use a tubular one which is sewn in a circular loop. Placed under the patient with the looped (not open) side positioned in the direction of movement. To place the slide sheet/s under a patient, firstly turn the patient over onto one side. Then position it beneath them, flat on the bed or trolley. Gently roll the patient to lie flat on their back again. Then do the same on the other side. It should now be positioned correctly. Pick up the top slide sheet (or the top looped part of a tubular one) and gently pull in the direction of movement. You might find that flat slide sheets with in-built handles are easier to use. Always make very slow movements, as they are very slippy. You want to avoid the person sliding off the bed entirely! IMPORTANT: Please note that professional patient handling training is vital for anyone attempting to use a slide sheet. In NHS England hospitals, some theatre staff wear light or mid blue scrubs, so do A&E staff nurses, nurses and sisters. Sometimes, NHS England consultants and hospital doctors wear blue theatre scrubs too. In NHS Scotland hospitals, you’ll see nurses and midwives wearing mid blue uniforms and clinical support staff wearing pale sky-blue uniforms. In NHS Wales hospitals, scrubs are only worn in operating theatres. However, the following staff do wear blue nursing tunics: staff nurses, sisters / charge nurses, clinical nurse specialists and midwives. In private hospitals, clinics, veterinary practices, GP surgeries and residential care homes you may see staff wearing blue scrubs too. Each business will have their own proprietary dress code to adhere to. So, as you can see, it’s difficult to be precise about who wears blue scrubs. How do I put on a scrub suit? Hospital staff wearing scrubs suits in theatre must follow the strict instructions provided by the hospital. Put on the short sleeved scrub top over your head. Make sure that any undergarments are fully covered. The sleeves would ideally be at least 10cm above the elbow to avoid getting wet sleeves. Put on the scrub trousers, again making sure any undergarments are fully covered. Pull the tie-waist closed. Make sure that the trouser legs do not touch the floor at all, to avoid transferring bacteria from one area to another. Wear closed toe non-slip theatre shoes or boots. Hair must be completely covered with a clean, disposable theatre hat. Beards must be covered with a beard hood. Follow the set scrub up procedure, which involves intensive hand and arm washing for at least 5 minutes, to remove bacteria on the skin and in the top layers of skin. Finally, put on a surgical mask over your face and put on your protective spectacles. If you are wearing a scrub suit for any other purpose, e.g. it’s your nursing uniform and you won’t need to enter an operating theatre, you can wear your scrub top over another piece of clothing such as a t-shirt or vest. The Interweave Performance scrub suits are fully reversible. For the scrub top you wear it with the v-neck at the front and you can wear it inside out as the stitching is fully enclosed and there are pockets on both sides. For the scrub trousers, the stitching is again fully enclosed and there are pockets on both the inside and outside, meaning you can turn them inside out to wear them. We try very hard to provide high quality customer service to all our customers, so if you felt the service could have been better please do contact us and send an email outlining any issues you have experienced. We welcome the opportunity to listen to your feedback and make improvements to make sure we are constantly striving for excellence. How do I unsubscribe from Interweave marketing emails? If you would like to stop receiving marketing communications from us, please open up a previous email you have received from Interweave and click the Unsubscribe link at the bottom of the email. This will automatically prevent us from sending you any email marketing messages. Otherwise, if you can’t find a previous email please contact us to request that we opt you out. Please note that even if you have unsubscribed from marketing communications, our Customer Services team will still be in touch with you about any orders you have placed as part of our after-sales service.